Thanks, Ravindra for the story. 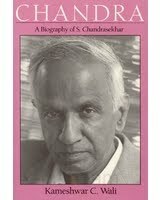 The book also tells an interesting story of Chandra's dedication as a teacher. Apparently, for a class of two students Chandra drove 100 miles one way. It turned out that both got Nobel eventually. It is like 100% of your class getting a Nobel! Thanks Vinay for your reply and the interesting story. If I am not wrong, these students were awarded Nobel much before Chandra got his. :-) So, students doing better than a teacher is perhaps the best form of satisfaction a teacher can ever get. Secondly, I will like to share another piece of information that might be useful. I first read Chandra biography in a book titled "Chandra and his Limit" written by G. Venkatraman (ex-director at National Physics Laboratary) and published by Universities Press. This book is beautifully written and filled up with lot of introductory material on basics of astrophysics and many anecdotes. In fact, Universities Press has a collection of books written by G. Venkatraman on many of the illustrious Indian scientists (S. N. Bose, Meghnad Saha, C. V. Raman) and on topics in Physics (relativity, 3-part series on quantum mechanics, thermodynamics etc). Each book in this series cost hardly 150-200 bucks and targeted to create interest in teenage children about basic sciences and great scientists. I had received two such books, one on Bose and another on Chandra, as prize in some exam in 12th std. These books made such an impression on me at that time/age, that I had seriously started thinking of opting for basic sciences (Physics) than Engg. Later, I made it a point to collect almost all the books in this series (partial thanks to Gangaram's book shop). Apologies for a long comment here with some personal memories. But I thought,you may be interested in seeing some of these books written by G. Venkatraman, just to see his writing style and the way he has told the concepts and stories in Science, so lucidly and in an interesting manner. Secondly, I sincerely believe (from my own exp) that these books can be used as a good medium to kindle interest in high school students about basic sciences. Hope this is useful. Thanks, Ravindra. I will definitely check out G. Venkataraman's books. Any chance of visiting Bangalore? I was planning to visit B'lore this Dec, but it looks difficult as of now. In that case, will like to visit in early next year or in summer. Will definitely like to meet you then.